When Princess Diana died in Paris's Alma tunnel, she was thirty-seven years old. Had she lived, she would turn fifty on July 1, 2011. Who would the beloved icon be if she were alive today? What would she be doing? And where? One of the most versatile and bold writers of our time, Monica Ali has imagined a different fate for Diana in her spectacular new novel, Untold Story. Diana's life and marriage were both fairy tale and nightmare rolled into one. Adored by millions, she suffered rejection, heartbreak, and betrayal. Surrounded by glamour and glitz and the constant attention of the press, she fought to carve a meaningful role for herself in helping the needy and dispossessed. The contradictions and pressures of her situation fueled her increasingly reckless behavior, but her stature and her connection with her public never ceased to grow. If Diana had lived, would she ever have found peace and happiness, or would the curse of fame always have been too great? Fast forward a decade after the (averted) Paris tragedy, and an Englishwoman named Lydia is living in a small, nondescript town somewhere in the American Midwest. She has a circle of friends: one owns a dress shop; one is a Realtor; another is a frenzied stay-at-home mom. Lydia volunteers at an animal shelter, and swims a lot. Her lover, who adores her, feels she won't let him know her. Who is she? I really wanted to love Untold Story. 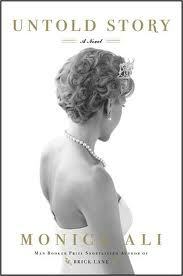 I grew up watching Princess Diana, from laying on the floor my legs splayed behind me, hands cupping my chin as I watched her walk down the aisle to become a princess at the tender age of six (is it any wonder that I have ridiculous romantic notions?) to the demise of her marriage and untimely death and I couldn’t wait to devour this story. Sadly though, I was disappointed. Untold Story had an intriguing premise. How far would someone go to escape their lives? Could such a high profile individual get away with it? How could they leave everything behind, especially their children? I was fascinated, but somehow eventually grew disappointed. The novel begins with the hook of Lydia not showing up to her own birthday party and then flashes back one month. This intrigued me, but shortly after we jumped backwards again to ten years prior which included a point of view shift to Lawrence, her trusted confidant and co-conspirator. It was he who helped her escape and its his death bed confession we’re privy too. This provided much necessary information about how she was able to pull of her ‘death’, but I was more interested about how she was living and I would have loved to see it as her memories which I think would have endeared me to her more instead of hearing her anguish from a third party. I simply didn’t care much for his perspective or voice and was pleased when this part of the story ended so I could continue on in the present. I really enjoyed Lydia’s friends. They were all interesting, dynamic characters and I would have liked to see more from them in the end, especially as she had never really experienced this level of friendship. Although indicative of her level of trust and need to move on should anyone come close to uncovering her truths, she had grown to trust these woman and I would have like to see some more interaction with them. All in all, I was disappointed and this Untold Story ‘fairy tale’ didn’t really hold up for me. Thank you to Simon and Schuster for the review copy! All opinions are our own.